Children's expectations about dentistry and dental care can be quite different than those of their parents, and so taking a hands-off approach can sometimes go a long way in making those first appointments go well. Most adults have had one or two less than pleasant dental experiences in their lives. Whether it was finding out you had 6 cavities at your first dental appointment at the tender age of 7, or that root canal you had to undergo in your late 20s, those unpleasant dental experiences can leave a mark on even the toughest adults. If you experience any fear, anxiety, or general discomfort at the idea of going to the dentist, it can be very easy to accidentally convey these feelings to your children, even when you’re actually trying NOT to. It’s all too easy to unintentionally infuse soothing messages with hints of the anxiety you really feel, in spite of your best intentions. Modeling a positive but casual attitude about dental care can be crucial in setting your child up for a successful first appointment. If you don’t think you can quite muster it, it might be better to say very little about your child’s upcoming appointment. And if you’re a nervous dental patient yourself, it may be best to stay out of the examination room during the appointment, and let the dentist and hygienist do their thing. Remember, the dental team has lots of experience working with children, and we know the best words and terminology to use to help kids feel comfortable and at ease. 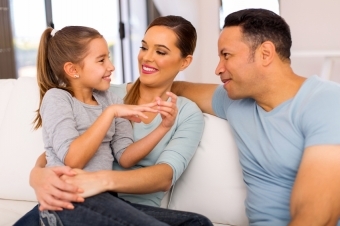 If you could use some more guidance on how to talk to your child about his or her first dental appointment, you can read on here, or get in touch with our practice today!